I recently released a series of videos to help celebrate March is Reading Month. In the videos, I read Johnny Tractor and His Pals and Little Michigan. 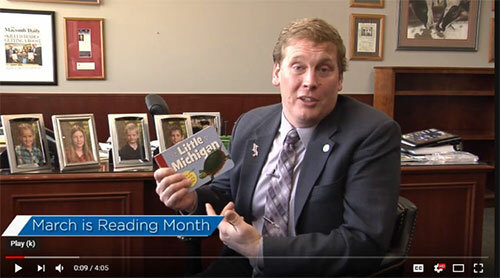 Given how large the 38th Senate District is, it would be very difficult for me to read to students in every school, but I wanted to do something to help celebrate March is Reading Month and share my love of reading with students. As a legislator, and as a parent, it is important that we foster a love of reading with our children. Establishing that solid foundation is vital to a child’s future success. It is my hope that these videos can help in that effort. If you are interested in sharing the videos with your children, please visit my YouTube channel at https://www.youtube.com/channel/UCiCEQvD85mL02xZWXhCDBng and be sure to click the Subscribe button while you’re there! I also encourage families to sign up on my website to receive free bookmarks. Sign up at https://www.senatoredmcbroom.com/contact/ and we’ll get them mailed. March 10-16 was Sunshine Week, a national initiative to promote open government. I strongly support Sunshine Week and government accountability, because the more we can make government transparent, the more accountable it will be to the people, and that can help foster a more trusting relationship, which is sorely needed. Coinciding with the event, the Senate Oversight Committee, which I chair, heard testimony on a proposal that would require all meetings of public university governing boards to be open to the public under the Open Meetings Act. 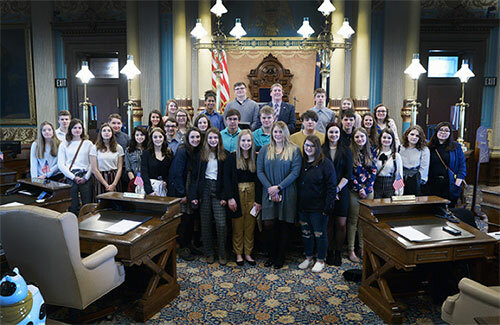 If Senate Joint Resolution E, which I sponsored, is approved by a two-thirds vote of each chamber of the Legislature, the question would be presented to Michigan voters at the next general election for approval to amend Article 8, Section 4 of the Michigan Constitution. Increasingly, university boards are conducting business, and making financial and other serious decisions, behind closed doors during so-called informal sessions. As public bodies, many of whom are elected, these boards, which receive and spend taxpayers’ dollars, should be required to comply with Michigan’s Open Meetings Act. This resolution would increase transparency and accountability so students, parents and taxpayers can see decisions being made by those running these public institutions. These are the same principles our schools, towns, community colleges and the Legislature operate under. I hope that we will approve the resolution in the coming weeks. I recently joined with Rep. Sara Cambensy on Feb. 28 to participate in Flannel Day. 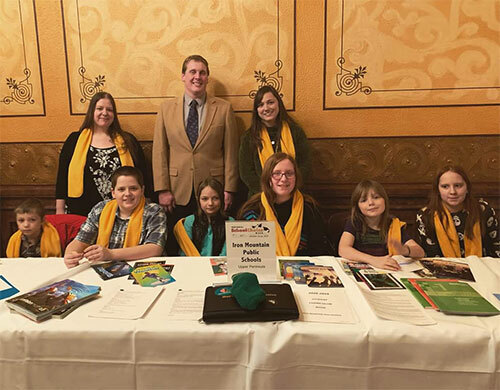 The event was coordinated by the Career Technical Education (CTE) Committee of Marquette and Alger counties in support of career technical education. 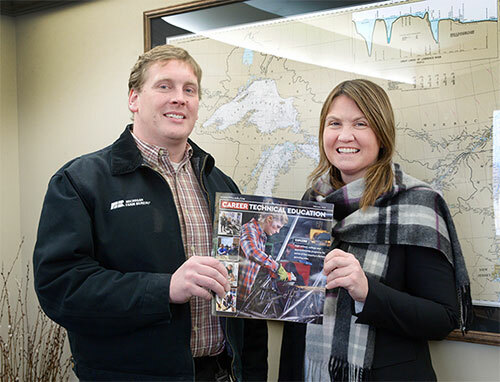 According to Northern Michigan University (NMU), the CTE Committee was established in 2013 to support secondary and post-secondary vocational programs to provide the skilled workforce needed to sustain and grow the U.P. economy. The committee’s focus is to help young people make the best possible career decisions before they graduate from high school. 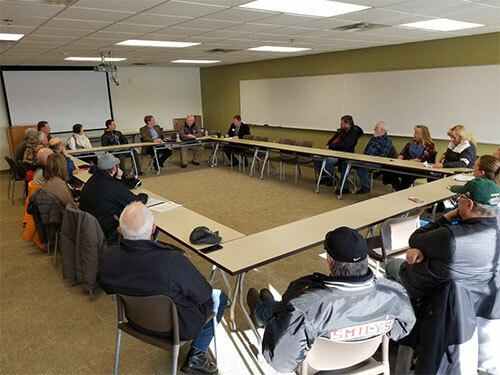 Throughout the Upper Peninsula and the rest of Michigan, thousands of good paying skilled trades jobs are going unfilled because employers are having a hard time finding qualified workers. I was proud to participate in Flannel Day because it helped bring attention to these incredible opportunities and to the career technical education programs that are working to help prepare the next generation of skilled tradesmen and women. For more information on the committee, visit https://www.nmu.edu/career-technical-education-committee-marquette. 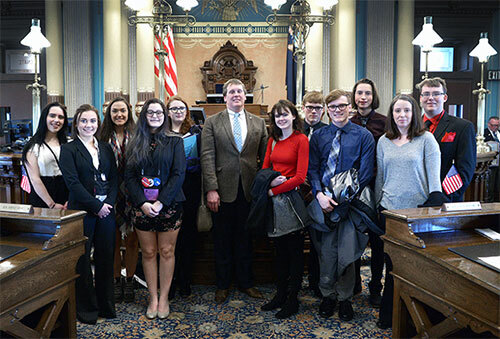 Last month, several students from high schools in the district visited Lansing as part of the Youth in Government program. It is always great to visit with fellow Yoopers when they’re in Lansing, and it was my honor to invite them to the Senate floor for a picture. Many people receive checks, prescription medications, packages and other items of value in the mail. Yet theft is an increasing problem. In fact, 2018 appears to be a record year for mail theft in Michigan. I recently supported legislation to better deter mail and package theft. Although it is a federal crime, the federal government doesn’t have the resources to prosecute unless the value of the stolen items is high enough or it involves identity theft. Senate Bills 23 and 24 would create a state-level mail theft crime with penalties, allowing more options for state prosecution and more consistent enforcement. The legislation has been sent to the House for consideration. State officials recently cautioned Michigan residents about a new phone scam operating in several areas of the state. Apparently, scammers are posing as public health officials in an attempt to obtain personal information that could be used to steal someone’s identity. It’s important to remember that local public health and Medicare officials will not call and request personal and confidential information, such as Social Security numbers, over the phone. People can report these calls by contacting the attorney general’s Consumer Protection division at 877-765-8388. As spring begins and the ice starts to thaw, people may begin to notice dead fish or other aquatic species, especially in shallow lakes, ponds and streams. Monitoring the health of aquatic life is an important part of fisheries management. People can report fish kills over 25 fish by completing the Sick or Dead Aquatic Species observation report at www.michigan.gov/eyesinthefield. Most of the time, fish kills are due to natural causes such as weather but they can be related to disease, pollution, chemicals or other non-natural causes. 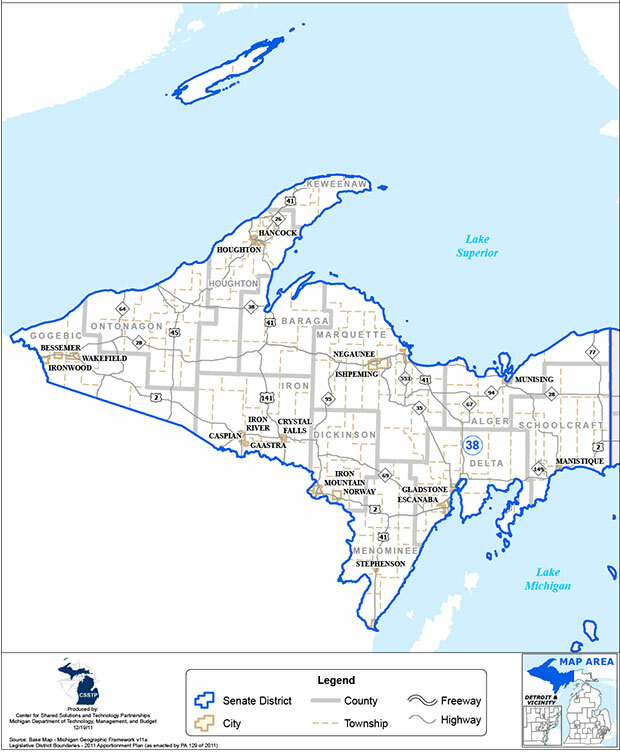 The 38th State Senate District includes the counties of Alger, Baraga, Delta, Dickinson, Gogebic, Houghton, Iron, Keweenaw, Marquette, Menominee, Ontonagon, and Schoolcraft in Michigan’s beautiful Upper Peninsula. Thank you for subscribing to my electronic newsletter! I am honored to represent you in the state Senate. As always, please do not hesitate to contact me if you have any questions or concerns. Please feel free to forward this on to others who may be interested in receiving the 38th District E-news. You may sign up for it also at my website.